Inform, improve, measure … repeat. This research philosophy operates across all Sesame Workshop productions, including Takalani Sesame. Sesame productions reach 156 million children daily in more than 150 countries making it the world’s single largest informal educator. Since 2000, the Takalani Sesame education team has contributed to the pool of more than 1 000 studies worldwide that Sesame Workshop has conducted over its 40-year existence. Takalani Sesame regularly undergoes formative assessments, finding out what young children are learning and what they like. We incorporate their feedback. Some changes defy adult preferences and challenge professional experiences, but that’s alright because we have a focus: the most important voice is the child’s. Being a data-driven show, Takalani Sesame gathers significant amounts of information from its target markets. In addition to our core audience (3 to 7 year olds), groups that matter are their grown-ups (parents and teachers) and their older siblings (highly influential others). Where is Takalani Sesame active? While best known for being a television programme, Takalani Sesame is also broadcast on radio, and there are regular outreach events in the communities we serve. We aim to reach children in every way possible, including through the most up-to-date technological ways. Most recently, we expanded our digital footprint by launching a dedicated YouTube channel alongside our two websites, social media identities and instant-messaging efforts. The Takalani Sesame YouTube channel (www.youtube.com/channel/UCSOzE3-7BQn7GtiftoiIRsg) is updated regularly and features episode segments in five languages – Sepedi, Afrikaans, isiZulu, Tshivenda and English. These are bite-size “edutainment” offerings that not only embrace multilingualism, but also help to further the educational mandates as outlined by our stakeholders and partners – the Department of Basic Education (DBE), Sanlam, the South African Broadcasting Corporation (SABC) and Sesame Workshop. How is our target market using digital? To understand our digital visitors better, we spent time in rural and urban crèches and primary schools. There were expected confirmations: more capable cellphones are getting more affordable and our lowly paid teachers are buying them; as the line between feature phones and smart phones narrows, mobile capabilities are advancing faster than some users can keep up with; data remains too pricey for many, even the employed, so free instant-messaging services and lower-cost internet usage dominate; and, the digital divide is also about age and younger educators are more aware of what is possible than older educators. A monitoring and evaluation component by an independent entity. All that before we could introduce the initiative to South Africa. The transfer of knowledge applies across all our platforms. We’ve produced supplementary textbooks, educational materials, outreach programmes, literacy projects and many other initiatives tailored to the needs of the communities we serve. 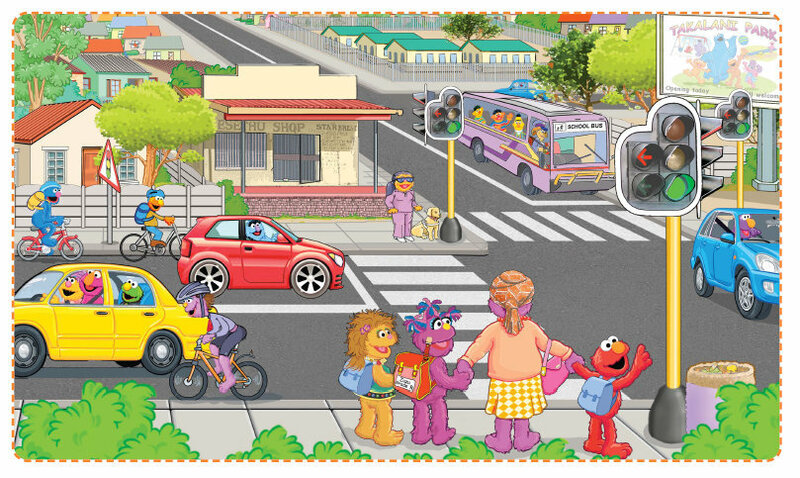 As part of our launch of the HIV-positive muppet Kamogelo (AKA Kami) in 2004, independent researchers confirmed that a child who has watched Takalani Sesame is four times more likely to have some knowledge of HIV/Aids than a child who hasn’t. Parents and educators who watched our television special “Talk to Me”, were twice as likely to talk to their children about HIV/Aids than those who had not watched it. A national survey commissioned by the Nelson Mandela Foundation further showed that our young viewers demonstrate measurable gains in HIV/Aids knowledge and attitudes, including basic knowledge of the disease, blood safety, de-stigmatisation, and coping with illness. In addition to wide research and market studies, Takalani Sesame leans on its partners for a universe of data and policies. This is especially true of the partnership with the Department of Basic Education (DBE). A case in point is our embrace of the DBE’s White Paper on e-Education. We have taken up the mandate for Takalani Sesame to live in digital spaces. 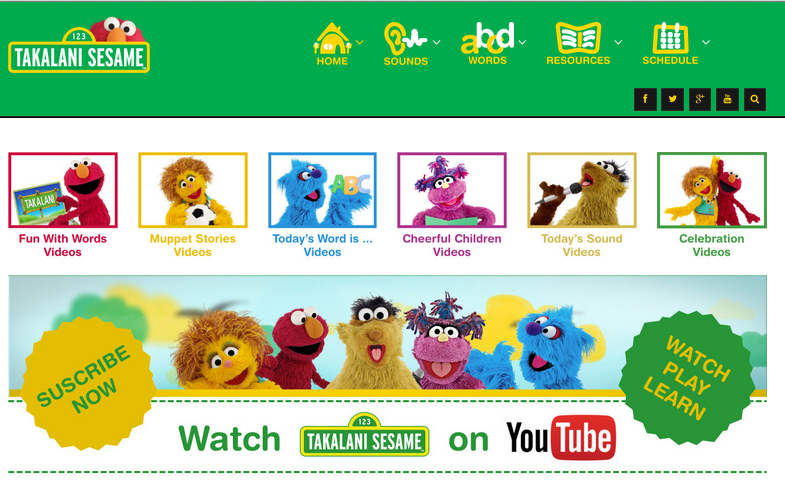 In 2013 we introduced a fun website [www.takalanisesame.co.za], a Facebook page and a Twitter handle @LoveTakalani. In 2014, we unveiled a special parenting, teacher resource and information-based website for educators and parents [www.earlychildhood-takalanisesame.co.za] and this year we’ve added the YouTube channel to further extended our digital footprint. The big reveal during our most recent site-based digital-behaviour information gathering exercises was that a popular service was the e-publication of research and policy papers. We intentionally select practice-focused scholarship and this seems to be paying off. Lerato Nomvuyo Mzamane is the Senior Multimedia Executive at Ochre Media, co-producers of Takalani Sesame and producers of many other groundbreaking programmes. She is a mother, teacher and activist with 30 years of experience in over 20 countries. This entry was posted in Education, Guest blog-post. Bookmark the permalink.